India, a stunning country with traffic conditions being just as stunning! 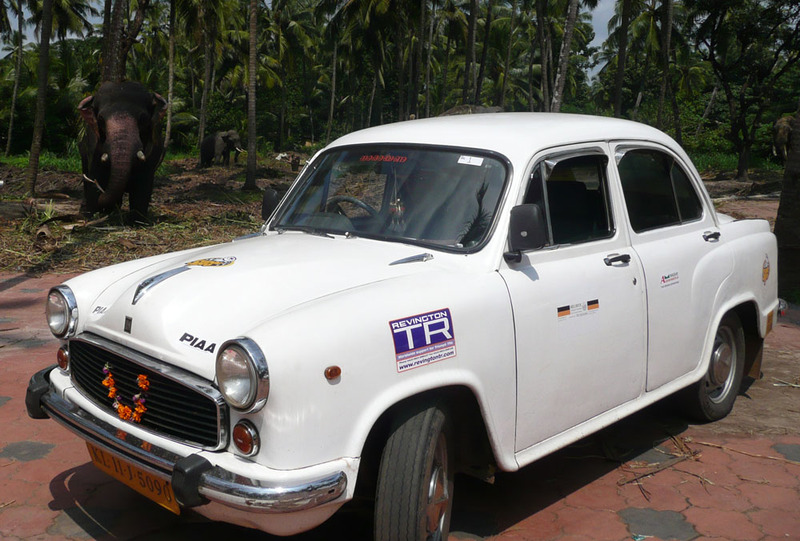 Neil & Sue Revington tell the story of their trip through the back roads of Kerala in a Hindustan Ambassador on Classic Journeys India Road Rally. Wow, what a driving experience! 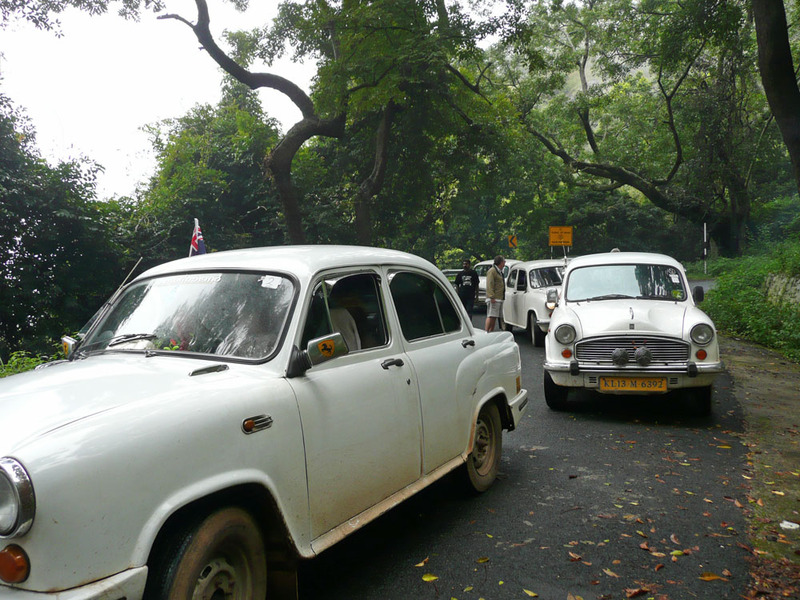 Driving in India is something that very few English people have done and the experience can be both terrifying and exciting at the same time. However in an Ambassador, affectionately known as an Ambi, we certainly had the right tool for the job. He comfortably got us across 1,300 miles of rough Indian back roads during this wonderful and eventful rally. The event is organised by Steve McCullagh of classiccarjourneys.co.uk and after having read an article about the event in Octane Magazine, I thought I would contact Steve to learn more about the rally. I was astonished to find that he lives 100m from where we hold our monthly local TR Meeting so Steve and I agreed it would be a good idea if he gave a talk to the TR Club. This happened in January this year and as a consequence of this not only did we sign up, but our friends Mike and Jacky Tidball decided to come along and take part as well. Trust us, it got a lot worse than this! 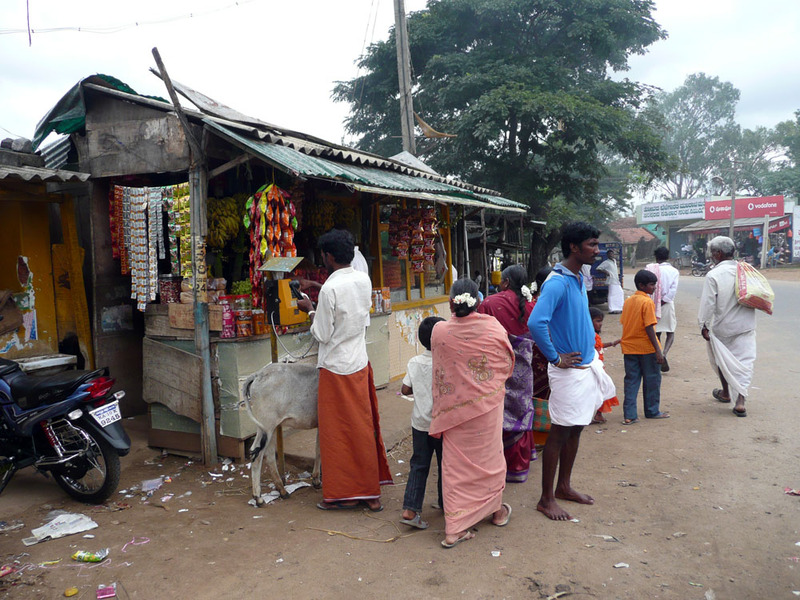 Traffic conditions in India, particularly in the towns can best be described as chaotic. Whilst there are traffic lights and roundabouts these are almost universally ignored! It would not be unusual driving along a country road, full of pot-holes where a tuk-tuk would be overtaking a pushbike, in turn being overtaken by a lorry. We would toot to overtake the lorry only to hear a huge blast on the horn as a bus would be overtaking us. Yet round the corner a bus would be overtaking a lorry, lights would flash, horns would be sounded and miraculously everybody would pass and go on their way, as though nothing had happened! And all this on a road that in England would be perceived to be only wide enough for 2 large vehicles to pass one another. Needless to say there are most often large areas of dirt on either side of the road, which allows this to happen. This was no exceptional circumstance but happened a 100 times a day; this certainly got some time to get used to! Excessive light flashing and horn tooting was the order of the day. All of this you may be surprised to learn is all done with a complete lack of road rage. You may expect under these circumstances there would be endless accidents, but this was not so. It became obvious that drivers and riders (there are thousands of motorbikes, many of which are Royal Enfield) pay significantly more attention to what is going on around them and concentrate all the time. This is simply because they have to, drivers in England could learn something from this! Before we get going, firstly I would like to introduce you to our faithful steed, the Ambi. 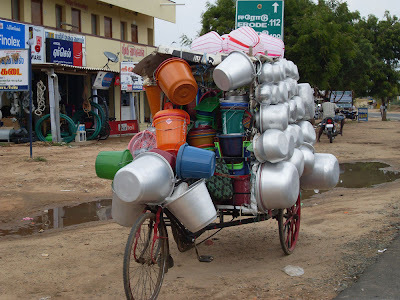 These vehicles are still the staple vehicle of India and having driven them you can see why. The car is basically a 1953 Morris Oxford with a 1600 or 2L Diesel engine, although petrol is available too. The original basic format of the 1953 car has not been altered significantly, even down to the drum brakes. The whole thing is built like a tank and the seats are incredibly comfortable. The cars are still made to this very day, the 2L DSL version that we used has a list price of RS 4,81,000, which is £6,800. These Ambis ply their trade as taxis for 50 weeks of the year and their owners are paid to allow participants in the rally to use them for the other 2. I tried to put the lights on once and the car filled with smoke...so I didn’t do that again. 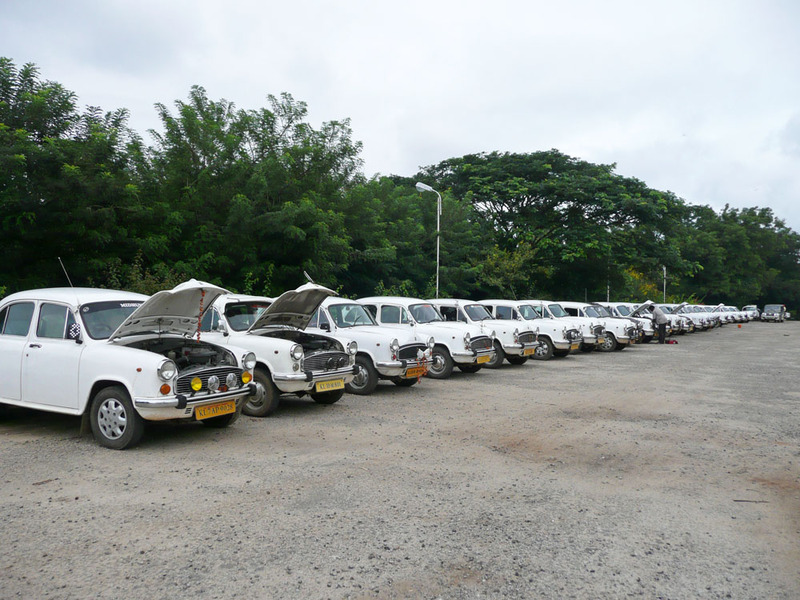 There were 30 Ambis on the rally and they varied considerably in terms of power and condition. Tyres varied from bald cross-plies, to nearly respectable radials. Our car may have had indicators at one time, but I never used them throughout all 1,300km of driving! I tried to put the lights on once and the car filled with smoke...so I didn’t do that again. A torrential downpour sorted the men from the boys, some cars had wipers with rubbish blades, some had none at all. Ours had one blade on the driver’s side, which when operated flicked through an arc of 10deg at the base of the windscreen and then for no apparent reason would flick to the side of the windscreen and operate its 10deg arc there, before returning to the base of the windscreen at some indeterminate time. You’d struggle to design a wiper system to do that, not that you would want to of course! 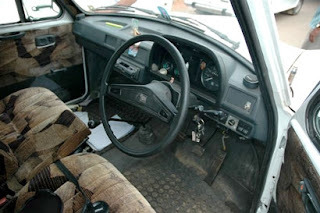 A universal feature of all the Ambis was the complete lack of an operational handbrake. In fact our car had had the inner sill repaired and there wasn’t even any evidence of a mounting position where a handbrake could have been mounted originally. 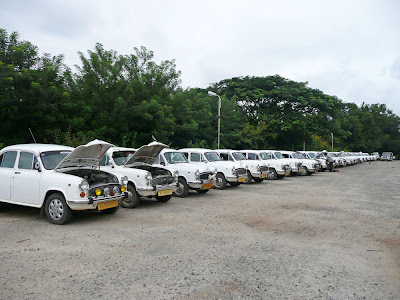 We were instructed by the organisers before setting off on the first day to search the grounds of the hotel for a large rock to act as a handbrake for the rest of the rally. Despite all this the cars are charming, reliable and very comfortable and a pleasure to drive. The Ambi is completely at home careering over endless potholes where modern cars would be gently picking their way carefully to avoid breaking the suspension, what a car, what a tool! I could go on about the Ambi forever, but I suppose I better talk about the rally. The event takes place in the south west states of Kerala, Tamil Nadu and Karnataka. It is not a timed affair but is more of a trial, the trial being to get you and the Ambi from place to place unscathed. The merit of this will be apparent from the introduction above. The Rally started in Calicut in Kerala on the Arabian Sea. Our first run took us 40km up the coast road to Kappad for lunch, by way of familiarisation with the car and the driving conditions. Kappad is the place where Vasco da Gama, the Portuguese explorer, landed in 1498. For those interested have a look at this wiki article. The Rally is more of a trial....the trial being to get you and the Ambi from place to place unscathed. Before we set off Dave the Chief Marshal gave us a very useful pep talk on how to drive in India. Irrespective of your level of driving expertise and previous rally experience, this talk was invaluable in understanding how to conduct yourself in Indian traffic. As his talk drew to a close Dave said “So, which side of the road do you drive on in India? Well, you should start on the left and see how you get on!” This set the tone for the Rally and proved to be uncannily accurate as we did later in the rally find ourselves swapping sides! The first day of the Rally proper was a long haul of 203km down the coast from Calicut to Cochin. The distance may not seem huge but when traffic conditions often restrict you to 40kph at best you will see this was a long day. On this stretch the scenery is not particularly spectacular, but we really got a flavour of rural India. At the end of the day Sue and I commented that we had seen just two white faces all day and were amazed by the distinct absence of western dress. Sarees being the preferred attire of girls and women alike (surprisingly this style of dress only became popular in India in the early 1900s), men generally wore a sort of Dhoti worn either ankle length or half-mast. Day 2 took us to an area known as the back waters an inland water system hundreds of kilometres long, which is a popular destination to have a holiday on a houseboat. The following morning many would agree was the real beginning to the rally. We climbed from Sea level through endless hairpin roads to Idukki at 700m to our final destination of the day Munnar at 1800m. The scenery was now staggering; traffic much reduced making driving considerably more enjoyable as the roads flowed out in front of us. 240km in all, time for tea! After all we were in the heart of tea plantation country and our hotel was fittingly called the Tea County Hotel. The following day was another long hall to Coonoor of 254km again the scenery was fantastic and a thoroughly enjoyable day of driving was had by all. However by now a ticking noise in the gearbox, which sounded ominously like a chipped second gear tooth to me, had degenerated into a tooth missing altogether, meaning I wasn’t able to use second gear at all. This made the mountain climbs somewhat more interesting, as invariably the engine couldn’t cope with third gear, but was too racey in first. 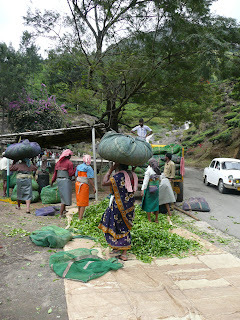 After 254km of driving in this way I was looking forward to our scheduled day off and lie in at Coonoor. However our Rally director Steve had other ideas! Fortunately all of his ideas where good ideas and this one was no exception. He had somehow managed to secure 60 tickets to ride the famous Nilgiras Mountain Railway, from its base station at Mettupalayam back up to Coonoor. This was to be a 3 hour journey with gradients up to 12½:1. The steam train has been running since 1899 and even in those early days of engineering the designers realised that the steel wheels would slip on the steel rails. This train is fitted with an ingenious rack and pinion system, where a rack is laid central between the two rails and the train drags itself up the track with a pair of pinions mounted underneath the centre of the locomotive, a fabulous piece of engineering! The bad news was that we were already in Coonoor and had to leave the hotel at 5 O’Clock the next morning to get a bus down to the base station to catch the first train up the mountain. 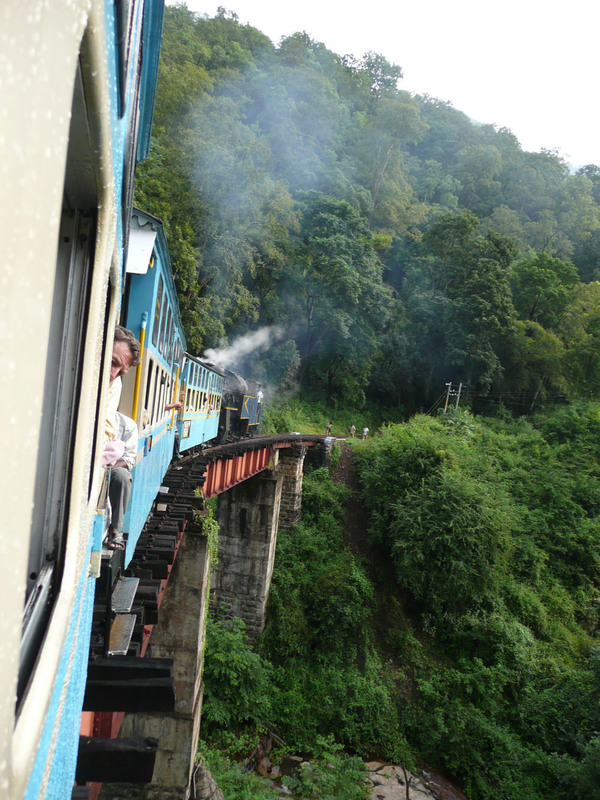 The trains final destination is the hill station of Udhagamanadalam (try pronouncing that disaster of a word or just call it Ooty like we do!) which was our destination for the following day, the highest point of our journey at 2300m. Our next destination was Mysore, the only obstacle being a 1600m drop in a matter of just 18km! The road was stunning; an endless ribbon of hairpin bends which were so tight, busses had to take a very wide sweep. This left a rather convenient piece of road on the inside, and I’m sure you would have worked out already that the Indians would take full advantage of this opportunity. This meant that the traffic on our side, us included, would undertake the bus, while traffic in the opposite direction would pass between us and the bus. This sounds horrendous but would go on repeatedly hairpin after hairpin without anyone batting an eyelid. At one point on this road Sue thought a photograph was the order of the day, so I pulled over applied the handbrake (open back door, take out stone, place under rear wheel) and spent a couple of minutes waiting for the Ambis brakes to cool off and watching the antics of the traffic. The lads took the engine and gearbox out of our car overnight, rebuilt the gearbox and put the engine and gearbox back, ready to use the following morning. The final few kilometres to Mysore proved even more difficult as first gear was now very noisy! I tried to use it as little as possible for fear of breaking the gearbox completely. I reported this to the organisers and it was agreed it was time for a fix. At this point I should point out that we had a travelling band of 8 local mechanics with us, who would look after oil and water checks and make sure that the cars were serviceable for us every morning. The lads took the engine and gearbox out of our car overnight, stripped the gearbox, found a second gear, rebuilt the gearbox and put the engine and gearbox back, ready for Sue and I to use the following morning. There was a cost of course, but this was a small fraction of what the cost would be in the UK. The beauty of using the Ambi for this kind of event is not only its strength and suitability for the terrain, but in the event of such a serious breakdown the cars are very easy to mend and parts are readily available on every street corner. We were fortunate to be in Mysore on a Saturday as the Palace is illuminated during the evening with 80,000 light bulbs, which are turned on simultaneously! The Palace itself is astonishing but when illuminated is truly magnificent. The last part of our journey took us back to Calicut to the Kadavu resort which was where we had started. This was a journey of 222km the last 5 of which were driven in convoy so that we could enter the hotel collectively with horns blowing and lights flashing (for those that had them!). There is no doubt that driving in India is not for the faint hearted and if India ever introduces a warranty of fitness test (MOT in UK) then there will only be one item on the checklist and that will be: does the horn work and is it loud enough. Sue and I had not been to India before and were overwhelmed by the beauty of the countryside and the friendliness of the local people. It is difficult these days to find anywhere in the world where it is safe to travel and not see any obvious tourists, which is an unusual experience giving a genuine feeling of exploration. I would thoroughly recommend the rally to anyone who fancies taking a rather different look at India, Steve can be found at classiccarjourneys.co.uk.